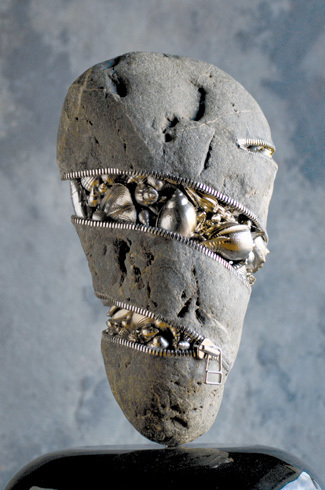 Gleaning from his family business, the natural beauty of the city of Matsumoto, and his own expression, Hirotoshi Itoh turns stone into surreal sculptures. 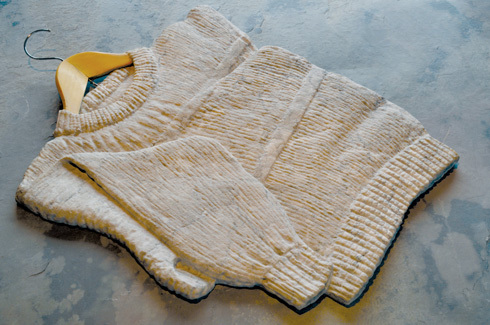 By etching the surface of the stones, Itoh achieves unbelievable accuracy in replicating the textures of fabric and wool. Given that his family has been involved with stone work since 1879, and that he had enrolled himself in the Metal Works Department of the Tokyo University of Arts, all set to take over his family business, it is no wonder that Hirotoshi Itoh found inspiration and a very solid form of expression in the stones that surrounded his place of residence. When he graduated from the Tokyo National Fine Arts University in 1982, he returned to Matsumoto, to the stone masonry his family managed. Their primary business was creating stone lanterns, gravestones, tombstones and memorials. This was the environment he had grown up in, observing members of his family, deftly creating objects from stone. Hirotoshi Itoh was exposed to a variety of skills, techniques and materials and equipment used in stonework. As a result, he was drawn to the idea of working with stone. Also living in a city where granite and marble were in abundance, he soon began to experiment with the material in his spare time. 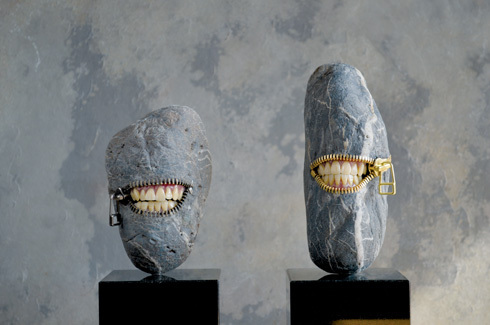 He commonly uses unrelated objects like shells, teeth, rope, thread and metal objects, against a background of stone. It was only a matter of time before he graduated from making lanterns and gravestones, to by capitalising on the naturally occurring unique forms of the found stones creating unique, one-of-a-kind sculptures. By adding a big dollop of whimsy to the existing shape of the stones he arrived at the subject of each of his projects. Itoh describes the city of Matsumoto, where he lives, to be rich with natural beauty. Flanked by splendid mountains and cascading water bodies, the stones he has access to, have been weathered by these fresh-water streams for decades. The result is a natural habitat rich in a variety of stones in a host of sizes, shapes, colours and textures. Applying the traditional masonry techniques he observed and learned and using standard equipment like saws, chisels, hammers he etches and shapes the stones to create surrealistic objects. He is inspired by things he sees around him, by experiences in his daily life, and the result is objects that are beautiful, imaginative, often tongue-in-cheek, quaint and quite unbelievable too at times. Many of Itoh’s works are inspired by mundane objects seen in our everyday lives. His work broadly falls into two categories. In the first, by altering the natural surfaces of marble or granite, he creates sculptural forms and shapes, to look like objects that are not made of stone. The finished forms look amazingly like articles made of wool, rope, paper or even soft fluffy fabric. In the second, using the naturally smoothened cobblestones, he makes clever interventions – mostly by the addition of an object or a different material like metal, glass or even coins – to give the stone a totally different character and a life of its own. It is as if in each stone that he picks up he sees within it a hidden form that needs to be brought out. The completed pieces are engaging to say the least and often draw expressions of both awe and humour from the observers. 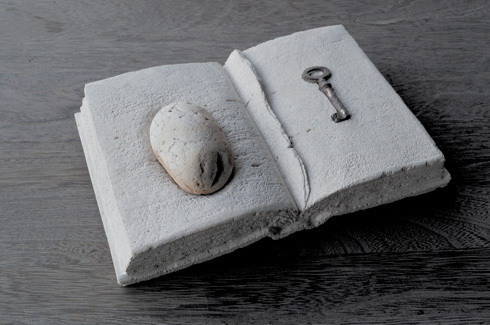 Inspired by simple objects from his life and everyday experiences, he likes to create illusions that make lifeless pieces of stone seem like so much more. Today, Hirotoshi Itoh is widely renowned for this ability to very simply create imaginative pieces of art out of a material that is known to be unmoving and cold. His work succeeds in making stone look like anything but stone; the fluid and malleable look of his creations is a testament of the effort and expertise that goes into it. A large part of his work is rooted in creating objects out of stone, but such that display a softness quite unlike stone. 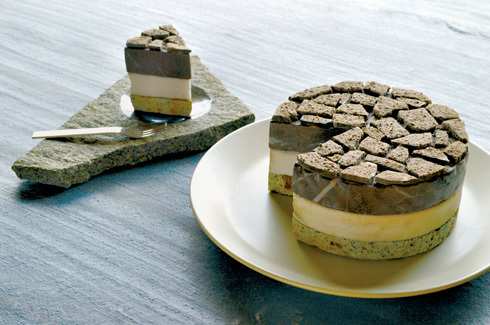 This soft gooey cake gives no clue to the hard and unwieldy stone it is crafted from. Inspired by traditional streams of Japanese thought, he emphasises the need to retain the natural shapes, colours and beauty of his material. He feels compelled to stick to the naturally found, original shapes of the stones he picks up by the riverside. In his own words, “Respecting and utilising the natural characteristics of original material is a very old and important aspect of Japanese culture.” This ties in very closely to the Japanese concept of creativity known as mitate – creating new things, by taking something of contextual significance in one space, into another and giving it a different context altogether. Despite being a contemporary artist and creating fairly modern pieces of art, Itoh’s roots go deep. His foundation is embedded in concepts of ancient Japanese wisdom, the culture he grew up in and the natural habitat that surrounds him.